Notes: Data are from 2014. Among adults 18 years of age or older. 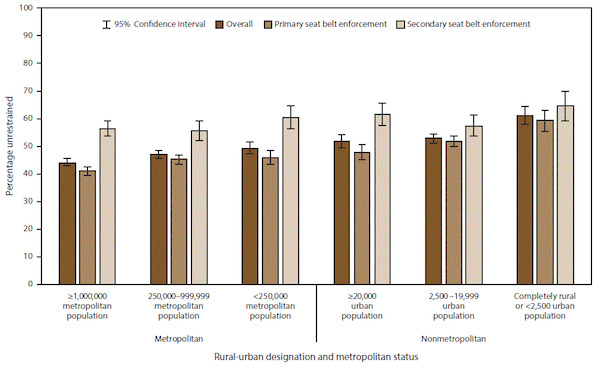 Rural and urban designations were determined using the U.S. Department of Agriculture’s 2013 rural-urban continuum codes. Metropolitan counties include counties in metropolitan areas of ≥1,000,000 population, counties in metropolitan areas of 250,000–999,999 population, and counties in metropolitan areas of <250,000 population. Nonmetropolitan counties include counties in nonmetropolitan areas with an urban population of ≥20,000, counties in nonmetropolitan areas with an urban population of 2,500–19,999, and counties that are completely rural or with <2,500 urban population. In 2014, a total of 33 states and the District of Columbia (DC) had primary seat belt enforcement, 16 states had secondary enforcement, and one state (New Hampshire) had no requirement for seat belt use by adults. States with primary enforcement in 2014 included Alabama, Alaska, Arkansas, California, Connecticut, Delaware, DC, Florida, Georgia, Hawaii, Illinois, Indiana, Iowa, Kansas, Kentucky, Louisiana, Maine, Maryland, Michigan, Minnesota, Mississippi, New Jersey, New Mexico, New York, North Carolina, Oklahoma, Oregon, Rhode Island, South Carolina, Tennessee, Texas, Washington, West Virginia, and Wisconsin. States with secondary enforcement in 2014 included Arizona, Colorado, Idaho, Massachusetts, Missouri, Montana, Nebraska, Nevada, North Dakota, Ohio, Pennsylvania, South Dakota, Utah, Vermont, Virginia, and Wyoming. New Hampshire was grouped with secondary enforcement states for analysis purposes. Data Source: Fatality Analysis Reporting System. This entry was posted in Medicine and Society Data Watch on September 27, 2017 by Genevra Pittman.